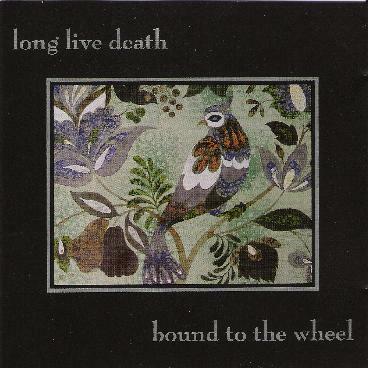 Long Live Death - "Bound To The Wheel"
Long Live Death describe themselves as "freak folk" and it's an apt description. Think of psychedelic folk like The Incredible String Band, but overall more dark and spacey, with pagan/mystical lyrics and you'll get an idea of their sound. Other comparisons might be made to dark wave folk groups like Sol Invictus and Current 93 or the more acoustic inclinations of forest metal bands like Agalloch. The Baltimore five piece manages to conjure up something compelling and mysterious, something that hints at things beyond our understanding, half glimpsed in the forest beneath the pale moonlight. Besides the more traditional acoustic guitars, percussion and vocals, Long Live Death utilizes less traditional instruments like gong, cello (and what sound like other higher pitched string instruments), and Theremin, with touches of synthesizer as well, to create a rich, evocative, and quite varied sound. The vocals range from melancholy dirge like chants and mysterious whispers to wild, feral growls and beautiful harmonies. And whilst the general mood of the album is a dark one, there are some changes of pace, like the rhythmic Two Voices, which has a distinctly medieval feel to it, but dives deeply into strangeness with bristling electronics and Praise, which is like a spiritual 1960's folk singalong. Another one is the handclapping, folk rock of Join Us (though some listeners queasy about bodily fluids might get a little pale listening to this one!). A favorite of mine, though, has to be the profoundly spacey closing track Of One, which stresses the darker gothic influences of the band. For more information you can visit the Long Live Death web site at: http://www.longlivedeath.net.